How long ago did this tree fall to the ground? Did it fall during a fierce thunder storm with high winds and driving rain? Maybe, a speeding driver tried to make a sudden stop, jumped the curb and hit the tree. Texas has endured so many years of drought the tree roots may have succumbed to dry rot. Whatever the cause, this tree appeared to be dead waiting to be carted away to the brush recycling center. 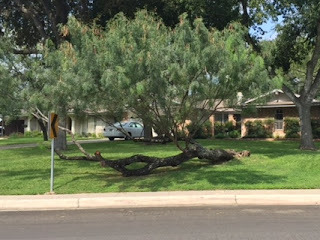 The owner evidently did not remove the tree. Over time, a new branch sprouted generating green leaves from a tree that was once dead. The homeowner has a new tree, although disfigured it still provides shade and a wonder to passersby. The dead can live again. We have all fallen. Some have been left for dead. Who knows what took you down? Not too long after declaring “You are the Christ, the Son of the living God”, Peter denied Jesus three times. His failure is apparent and he is a broken man. Yet, his Owner does not send him away into the trash heap of the world. Despite his failure, Jesus sees in Peter, the earthly head of the church. Peter is commanded to feed the lambs, tend the sheep and feed the sheep. Peter is now dead to self and alive to Christ. It matters not how we fall down, our Lord is ready to pick us up and put us back to work. Others will see our new lives and wonder how someone who seemed dead can live again.